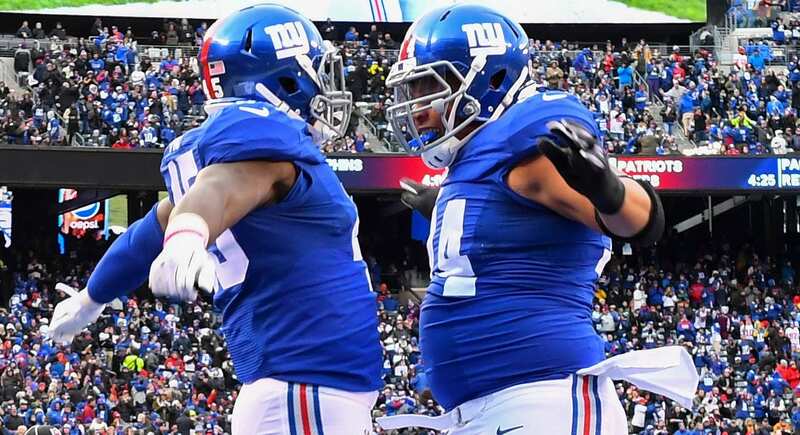 The New York Giants are bound to see a major improvement on the offensive line going into the 2018 season. They acquired left tackle Nate Solder for $62 million over four-years, and left guard Patrick Omameh for $15 million over three-years. General manager Dave Gettleman also retained center Brett Jones and moved former LT Ereck Flowers to the right side to compete at RT. Flowers and undrafted sophomore Chad Wheeler will battle it out for the starting role. Predicting what the offensive line might look like is difficult, as it all depends on the draft, but let’s give it a try nonetheless. Solder will immediately improve the Giants’ and Eli Manning’s blind side. This should give Manning more time to allow him to find his receivers more frequently. In 2017, Manning was forced to get rid of the ball in less than three seconds on average due to the inability of the offensive line to block. The departure of Justin Pugh left a huge hole at left guard for the Giants, and they decided to look towards the Jaguars for support. Seeing that Leonard Fournette had such a successful year, Gettleman took a flier on former Jaguars left guard Patrick Omameh. The Giants signed Brett Jones to a modest deal in the hopes of plugging in him at center. After former center Weston Richburg went down with a concussion, Jones filled his spot valiantly. Moving into the 2018 season, Jones should get his opportunity to perform as a starter for a revamped Giants offense. This is my wildcard. I’m predicting the Giants trade back in the draft and go after UTEP lineman Will Hernandez late in the first round (Bills 22nd overall pick). Plugging Hernandez in would immediately improve the right guard position and hopefully solidify the line for years to come. The UTEP star lineman is 6-foot-2 and 327-pounds. Hernandez has short arms and a smaller frame, but his power is unparalleled. He’s ferocious in the run game and simply overpowers interior lineman at the point of attack. He would be a stellar addition to a team trying to piece together a decent offensive line for Manning. I have an odd feeling Flowers is going to revitalize his career at the right tackle position. While he struggled mightily at left tackle, he could see an improvement on his dominant right side. Adapting to the right tackle position from a technical standpoint could be Flowers’ biggest challenge, but if he can tackle (that’s all he did against edge rushers last season) that obstacle he could end up surprising everybody.